Today’s word is GUBBINS. I recently learned this from one of my British friends. It’s a pretty cool word and has several meanings, all of them British. The word of the week is FABULATE. I know, I know. This one sounds made up. I assure you, it isn’t. It’s a real, bona fide word. It means to relate a story or a fable. To tell untrue or invented stories. It comes from the Latin verb fabulari. Can I just say that I love the root word fabulari? I want to use it in the wrong way as I want to say, “Wasn’t that guy fabulari?” as in wasn’t that guy fantastic? Who knows, I may have to have a character in a story say that in a dreamy way about the hero in a romance novel. Doesn’t it sound divine even though it’s not the right way to use it? Today’s word is a fun one that I’m sure not many people have heard about. I know it was new for me. The word is MONDEGREEN. It’s a noun and means a misunderstood or misinterpreted word or phrase from mishearing lyrics of a song. Haven’t we all done this? My poor husband is notorious for it. It comes from the 1950s from Lady Mondegreen, a misinterpretation of the phrase “laid him on the green” from a ballad called “The Bonny Earl of Murray. What song do you mess up? This week’s word just sounds fun rolling off the tongue, doesn’t it? What exactly is a QUIDNUNC you may ask. Interestingly it comes from two Latin words- Quid meaning “what” and nunc which means “now”, so the literal translation would be “what now?” but it actually means an inquisitive and gossipy person. I guess it comes from the folks in town saying, “What now” whenever the village gossip walked up. Anyway, it’s a fun word, isn’t it? Today’s word is inspired by my feline family member, Hobbes. He’s CREPUSCULAR and makes me laugh when he gets spun up in the evenings. CREPUSCULAR means of or relating to twilight. It also means active or occurring during twilight. There are a number of animals that are defined as such, including cats, rabbits, ferrets, bears, deer, moose, possums and even wombats. There are also a number of insects that are active near twilight. Drop this word into a conversation this week. Go ahead, you know you want to. 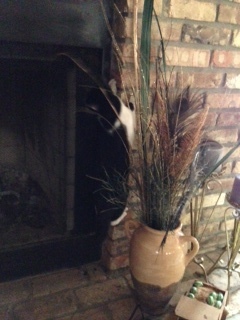 Here’s Hobbes climbing the fireplace. Can you see him? My son called me later to ask what that meant and when I told him he was quite relieved since he thought the old guy didn’t like him. My son thought it meant a bad thing. It actually means that he’s a person of integrity and honor. I’m glad the grandfather thought so since my son was raised that way and he seems to be carrying on his life in that manner. The word itself is Yiddish and comes from the German word for person. Today’s word is PUERILE. It means childishly silly and trivial. I’ve had to deal with some of those kinds of folks this week so it was a good choice to use- at least in my corner of the world. Immature people make me crazy. It comes from the French pueril or Latin puerilis, from puer which is boy. In Spanish it is pertaining to childhood. I can’t embed this here but check out this video of Tim Curry for Halloween. Click here to watch him in The Worst Witch. Just for fun, let’s use WORST as the word of the day even though I’m quite sure you already know what it means. Worst is the superlative of Bad or Ill.
3. most lacking in quality. Notice how the word most is used in all those definitions?